Today, there is a great deal of attention paid to the United States’ southern border abutting Mexico. Some on the American Right are demanding that the federal government build a wall along the border to reduce the flow of immigrants to the country. The most thoughtful proponents of the wall argue that a nation without secure borders can hardly be considered a state. Others worry about the affect new cultures will have on American society, some embracing ideas of fervent nationalism. Those opposed to this policy offer a range of arguments against such a solution. They see a wall as a waste of resources. Instead, they argue for a more sensible approach to immigration, one that makes affordances for migrant workers, refugees, and others. They see the country’s immigration policies as too rigid and antiquated. Many point out that the current immigration laws are disconnected from the needs and functions of a more mobile and interconnected 21st–century global economy. In his book Lawrence B.A. Hatter explores these very issues, but does so for another time and in a very different place. Hatter interrogates the way the northern border of the United States functioned from the close of the American Revolution until the end of the War of 1812. He resurrects a fascinating if long-forgotten history of the Great Lakes Region that has important resonances with contemporary issues. Hatter’s story goes something like this. After the Peace of Paris, the words on paper that created a border between the now independent United States and the British-controlled Canadian province proved hard to enforce in practice. According to the terms of peace, the British were supposed to relinquish control of many forts in the Great Lakes Region, but that never really happened. More important for Hatter’s story, though, is the way policymakers envisioned how trade and travel would occur in the region. Hatter pays close attention to a series of negotiations between American and British officials who wanted to create a commercial agreement for the border region. At the time, American diplomats appeared willing to create an open border that would facilitate the relatively free flow of people and goods. While British negotiators embraced the American position, advocates for more mercantilist policies in London managed to block the potential agreement. As a result, the region operated as a free trade zone by default even if the two sides failed to come to official terms. For many Americans, their inability to enforce the border in the wake of Independence became a growing point of contention, evidence that the United States was not quite a truly independent nation. This uncertainty on the border often bred economic, political, and legal confusion. By the 1790s, the leaders of the new federal government under the presidency of George Washington were anxious to cement a formal commercial treaty with Great Britain that would address both oceanic and inland trade relations. They achieved their goal with the Jay Treaty in 1794. Americans gained greater access to British ports, and, in the West, the British agreed to evacuate forts on American soil by 1796. While the Jay Treaty achieved many of the Washington administration’s goals, it proved wildly controversial with the American people. Opposition was so strong in some quarters that its passage helped fuel the First Party system. Hatter’s study focuses on an often-overlooked element of the treaty that, for his thesis, proves essential. While the treaty may have required a British withdrawal from American territory, it also encouraged greater movement across the border. The treaty permitted individuals to declare their nationality at will, avoiding any official naturalizations process and allowing traders to shift their allegiances depending on their interests. They were “citizens of convenience,” the inspiration for the title of Hatter’s book. As the United States’ imperial ambitions shifted in the early nineteenth century, so too did its approach to border politics. During the Jefferson administration, policymakers adopted a grand strategy that was premised on continental conquest and unfettered oceanic trade. When they looked at their northern border, those in Washington grew concerned about the fluidity of the northern border as undermining their aspirations to control the interior. In a particularly astute observation, Hatter points out that the Jefferson administration’s desire for free trade on the ocean and a more regulated inland trade were not contradictions. Looser international trade meant more opportunities for the United States’ raw materials, while a stronger border meant clearer sovereignty in the west and control of the trade there. In the years that followed the Treaty of Ghent, the United States’ imperial vision for the West was matched by their growing state power. Unlike the border written only on paper in 1783, the United States marshalled the means to regulate its northern border and those hoping to do business on it. It is somewhat ironic, then, that now two hundred years later, this northern border seems so stable, peaceful, and fluid. There are no calls for walls to the United States’ northern neighbor. Instead, the country is wracked by a debate about its southern border that has eerie parallels to Hatter’s earlier story. Those interested in diplomacy, immigration and trade policies, and geopolitical maneuvering would be well-served by reading Hatter’s timely book. Patrick Spero: Rezension zu: Hatter, Lawrence: Citizens of Convenience. 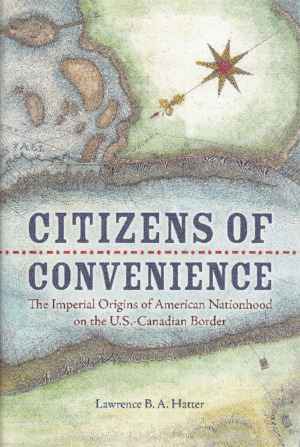 The Imperial Origins of American Nationhood on the U.S.-Canadian Border. Charlottesville 2016 , in: Connections. A Journal for Historians and Area Specialists, 13.04.2019, <www.connections.clio-online.net/publicationreview/id/rezbuecher-29829>.